This past month I experimented a couple times with juice fasting. Taking a 3-day break from food is challenging to say the least, but it was a beneficial experience that taught me a lot about my relationship with food. It reinforced the large role that food plays in my life, and its effects on me physically and emotionally. It made me stop and really focus on what I’m putting in my body. The idea of abstaining from food to detoxify the body is not a new one. Many ancient cultures and religions across the world have cleansing rituals that purportedly allow the body to rest and heal itself. Juicing is the latest incarnation of humankind’s quest for purification. Unlike the austere Master Cleanse which consists of sipping on lemon juice, maple syrup and cayenne pepper for 10 days straight, the newer juice cleanses are kinder and gentler. The idea of a juice cleanse is to provide your body with a massive dose of nutrition in a highly absorbable form that your body uses to “repair the damage” so-to-speak of the less than healthy food and lifestyle choices we all make. Juicing vegetables and fruits is a good way of getting large doses of vitamins, minerals and phytonutrients that would otherwise be impossible to consume in one day. In fact most juice cleanses on the market tout having almost 20 pounds of fresh produce in one day’s worth of juice! Cleansing for a few days can also help renew commitment to a healthy lifestyle motivating you to eat well and make good choices in the future so as not to undo all your good work. While people may opt to make their own juices, being able to buy pre-made freshly pressed juices is a convenient and foolproof way to try cleansing; and two companies that have been making headlines with their juice cleanses are BluePrintCleanse and Cooler Cleanse. They both offer a delivery service of 5 freshly pressed juices per day plus one nut milk for “dinner.” In my quest to discover the benefits of juicing for myself I decided to test out both cleanses (not back to back, in case you were wondering). I’ll be sharing my review of these two programs tomorrow and stayed tuned for a BIG giveaway! Have you ever done a juice cleanse before? I've attempted to make my own BPC juices, but the green one was a tad hard to swallow (granted I derailed from the recipe in a big way, so I'm probably to blame). On a positive note, even though the cleanse was quickly discontinued, it got me back into drinking enough water during the day and also helped me discover my new favorite tea (jasmine green tea). Can't wait to read your reviews! When you juice you won't be hungry. I promise! 3 days! Wow! I have to try doing that! Gorgeous clicks as always S! Look forward to your views on both girl.....the colors of the juices look exciting enough but the proof is always in the pudding!! i would never do a juice cleanse, but for someone who doesn't like veggies (me! ), juicing is a great way for me to get some! i love my juicer and use it about 4 times a week. so, so good. I love fresh juice and have done a few juice cleanses in the past. It has been a while and I think one of these days I'd like to do it again...looking forward to your reviews! I love the bright colorful juices! AND serving them in a martini glass...even better :) I don't know if I could pull off a juice cleanse, but subbing juice out for a meal or two a day is something I could manage! You make it look so beautiful Sylvie!! I wish I had that willpower! Beautiful photos! Almost makes me want to do a juice cleanse! No, I've never done one, but a few of my friends have and they swear by it. I just don't think I could go that long without eating. 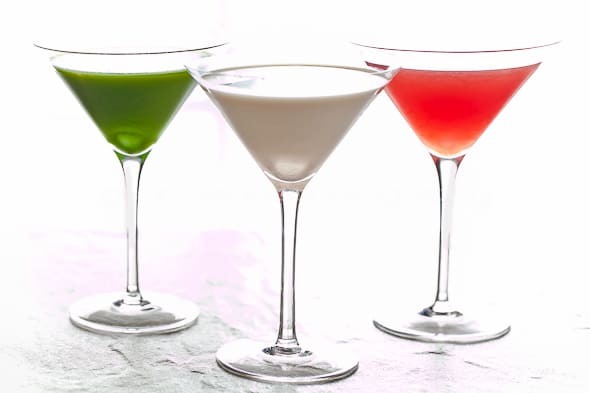 I could so do a juice cleanse if they were presented to me in a martini glass!! also, I could and should start my day with a green juice, but give up food all day would be extremely hard for me! I must admit Sylvie, I am yet to warm up to juicing but you make ot mighty attractive. So maybe there is still hope for me. I always like these posts of yours that are away from my realm of cooking. Something new to me or bringing it into my attention again is always positive especially when accompanied by such beautiful photography! I need to do this 3 day juice detox.... please and thanks. I've always wanted to try one, but whenever I look into it I am instantly intimidated by all the conflicting information out there. It will be nice to see what you have to say about your first-hand experience. Thanks! Lovely idea.......! I often go on fasts and this would be superb for me and keep me fully energized too .... ! I love juice cleanses! My first introduction to cleansing or fasting is through religions holidays, I'm Greek Orthodox. Though, later in life I began cleansing on a yearly basis for health purposes and continue to do so. I know some folks who cleanse with every season, I prefer to cleanse in late winter - pre spring. I hope you enjoyed your cleanse - I always feel so great afterward! I've been toying with the idea of juicing for a while, but never got around to it. I guess I have to buy a juicer first :). But, do you think blending fruits/veggies in a powerful blender (e.g. Vitamix) would still work as a "cleanse"? Yes absolutely! In fact that would be a whole juice since you would retain all the fiber. Or alternatively you could strain it to make a pure juice. Either way you are getting lots of vitamins and minerals. Just add enough cold fresh water to your veggies in a high powered mixer like a Vitamix and blend until they are super smooth. Very healthy! I would love to try this out. While I'm not really interested in doing a cleanse, I love the idea of juicing. I have a juicer and haven't experimented too much with it. 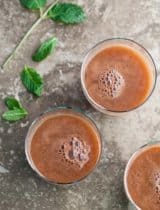 I would love some recipes for making juices that taste great and are healthy. Do you have any, Sylvie? When I was in San Diego last weekend I sampled one with kale at the farmers market. It was surprisingly good! I have a few recipes in rotation at the moment that I'm testing and I was thinking of maybe doing a post on that later if people were interested so thanks for asking! I'll definitely plan a post on that then. i so need this right now. i cannot wait until tomorrow! I have never gone without food for even a single day! I really think I should try something like this though... Do you feel very hungry when you are only on liquids? Do you feel tired? Can I go about my usual routine if I am on a special diet like this? 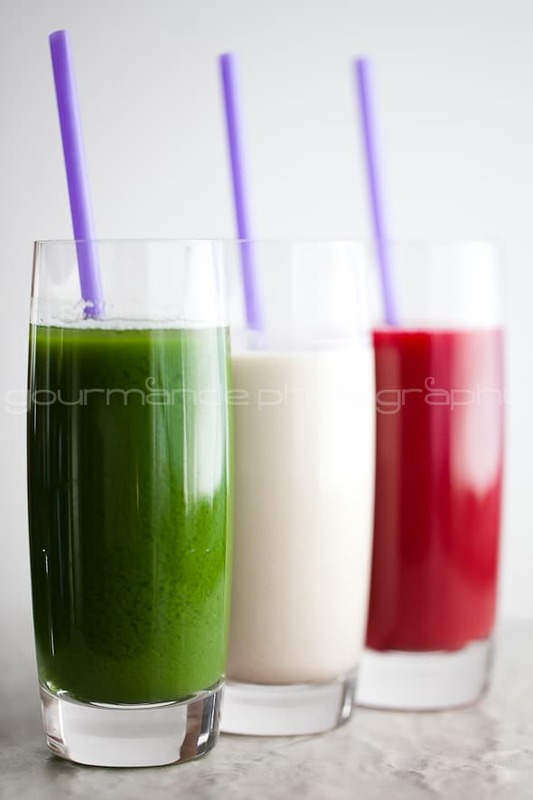 I address some of those questions in my next post here: http://gourmandeinthekitchen.com/2011/blueprintcleanse-review-cooler-cleanse-review/ If that doesn't answer all your questions or if you have more, I'm happy to answer more! I look forward to those results. I would love to juice, but there is no way I'm going to make my own. It's too much to buy, store and do. So I want to see what you think. The fad diet you mention (maple syrup etc for 10 days) is just that but I think a cleanse is a great idea. You have inspired me to try. Maybe for one day to start with eh?! One day is a great start! Even one green juice a day would be a good way to test out juicing and get lots of additional vitamins in your diet. Hi Sylvie, lovely photos as usual. I haven't done a total juice cleanse, but do incorporate a lot of green juices and smoothies into my diet. We start our day with a green monster, and luckily there's a cafe that squeezes fresh juice in the lobby of our office building! I've started heading down there for celery, beet, ginger afternoon pick-me-ups. Looking forward to reading more about the giveaway! I'm totally with you on juicing for good health. But I never thought of cleansing with juices--interesting! 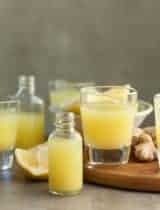 Like many I have never really tried a cleanse with juices! You make it look so good. I just love looking at your photography. Wow, that's incredible! What an inspiration your dad is, 60 days is extraordinary! Amazing! I like this idea a lot, and hope to go on it soon! Juicing...it even sounds intimidating! I wonder what kinds of reminders and tools you used to help stay on track. Three days sans food is incredibly impressive, but the rationale might make it easier. I hope I can do it someday! P.S. I admire your food photography; it's been the most difficult field of picture-taking for me I've ever encountered! Thank you! Doing the BPC and Cooler Cleanse was easy b/c they did all the work. They numbered all the bottles so you don't have to prepare anything, you just grab the next bottle and drink! In between juices I would drink lots of herbal tea and that helped. They also allow some foods like cucumber slices if you really feel the need to chew something. Perfection!!!! I tried so many times going on juice fast, could only last for maximum a day :-(. You have great will power Sylvie, I am totally inspired to try again... Thanks dear for sharing this. This is such an interesting concept - I have always been so intrigued by juice fasts and juicing. I love juicing. It's such a nice way to detox. I want to get a great juicer for myself for Christmas! wow - I haven't cleansed in a while but I appreciate the clean feeling that comes with drinking fresh juice. 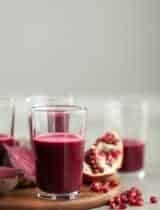 Great post to get people thinking about cleansing before xmas. I can't say that the master cleanse has ever been tempting, but those gorgeous juices in your pictures make me yearn for a major refocus on fruits and vegetables. Those colors are just eye-popping. Ah, you are a brave soul. Three days without food is a mental hurdle in and of itself, much less to actually do it!! But I have to admit to abstain from food for cleansing purposes and to do so with fresh pressed fruit doesn't sound like a bad thing. I would love to do a 3 day cleanse ... maybe revert to fresh juices myself as we don't have the luxury of this beautiful company here. Usually twice a year I cleanse. I've tried the BPC as well as the Cooler Cleanse. I prefer the Cooler Cleanse because of the variety in the juice selection. It also give you an opportunity to create your own "flights" where you can self select the juices you wish to drink (obviously, nutritionally I'm not sure if it "works" the same way the designated juice order works). The BPC juices are a lot thicker and quite honestly, the green juice after day one, made me want to shudder. The other challenge for cleanses are the prices. They're not cheap! But, cheaper probably than eating out. ANd, what's nice is not having to even think about what you're eating. All you have to do is open the fridge and take out the numbered bottle and drink! I recently interviewed Dr. Oz and asked him his take on cleansing www.myjudythefoodie.com/2011/11/up-close-and-personal-with-dr-oz/ great to have stopped in here. I will be back. I have done some shorter juice fasts and a few extended ones. I have never tried either of these products, but have juiced my own concoctions or bought quality juice from the store. It is much cheaper and probably just as effective to juice yourself. A juicer is on my list for 2012!! Congratulations to you on your cleanse! I did the juice cleanse for 10 days- ate healthy for a week and then went on the juice cleanse for another 10 days because I missed it. Makes you feel amazing- my headaches went away and I didn't depend on coffee anymore to give me energy through the day. It keeps you full if you drink enough and you don't miss food after a couple days- recommend for everyone! I went out and bought a juicer on a whim, really, this weekend. I started researching the power of juicing and have done a little bit of it over the weekend. I am going on a 3 day juice cleanse starting tomorrow and will only drink juice, that I juice, for 3 days, see how I feel and then make the decision on whether or not I want to continue for a full 10 days. I am then going to juice everyday and eat a Paleo diet. I cannot wait to feel better and look better. I am not doing it for the weight loss, per say. (Although, that is a much added benefit!) I am doing it because I am tired of being tired, confused, fatuiged and having blemishes. I NEVER had blemishes, even in high school. Now they cover my face. This has just started in the last month or so. I am ready to get this old 43 year old body into high and optimum performance. Here's to juicing! Salute! That's great Hanna, I think a combination of juicing and a clean Paleo type diet is a huge step towards the better health and weight loss you're looking for and wish you all the best! 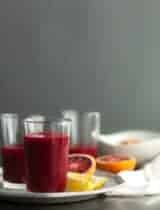 Good luck on your juice cleanse and your new diet, if you need any recipe inspiration I've got a few juice recipes and a large number of recipes that are Paleo friendly as well.